qBittorrent is an open source, cross platform, lightweight BitTorrent client software. It is designed to work faster; provides an intuitive user interface and is IPv6 compliant application. It can handle sequential downloading and is available in many languages. It is mainly developed in C++ and uses well known QT framework and python for the implementation of some features. The development of this project was started in 2006 and has been receiving constant updates till date. It has evolved into a stable, mature application by now. It offers integrated torrent search engine and Unicode support, and advanced operations like queuing, filtering, and prioritizing of running torrents. It also comes with an awesome integrated feed reader. It offers the feature of bandwidth scheduling as well. On Aug 2, 2015, the most recent version of this application, qBittorrent 3.2.3 has been made available for download. This new version comes with lot of bug fixes and introduces some cool new features as well. DHT (Distributed Hash Table) feature has been enhanced and revamped, and color schemes have been changed for various options to add more pleasing look and feel to the application. We can manually download and install this new release using source installation method but due to the number of dependencies, we will have to install many packages manually. Good news is that qBittorrent team manages both unstable and stable repositories for the application for Ubuntu operating system. So you can always install the latest version using PPA. Right now, this latest release has not been moved to the stable PPA, so we will need to use unstable PPA for now to install this latest version. 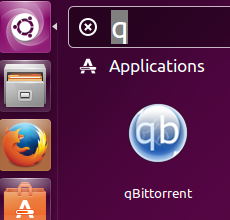 Launch your terminal and run following command to include the PPA for qBittorrent to your ubuntu system. Run following command to install the latest version for this torrent application. Congratulations, Installation is complete now. Launch it from Applications menu. There you go, start downloading stuff using this wonderful app. If you are looking to install stable (bit old) version of this application on your ubuntu system, simply import the stable PPA and install the application. Following three commands should do the job for you. It is a cross platform application and works flawlessly on Linux, Microsoft Windows and Mac operating systems. Over the passage of time, it has gained a good fan following and user base. It is feature rich application and have has memory footprints. It’s never a contributor to your system high load.